Calling all clean energy, clean tech innovators and entrepreneurs, scientists, engineers, marketers and inquiring minds young and old: Join us in developing a roadmap for the clean energy ecosystem our community of businesses and residents need to fuel their various social, economic and environmental aspirations. 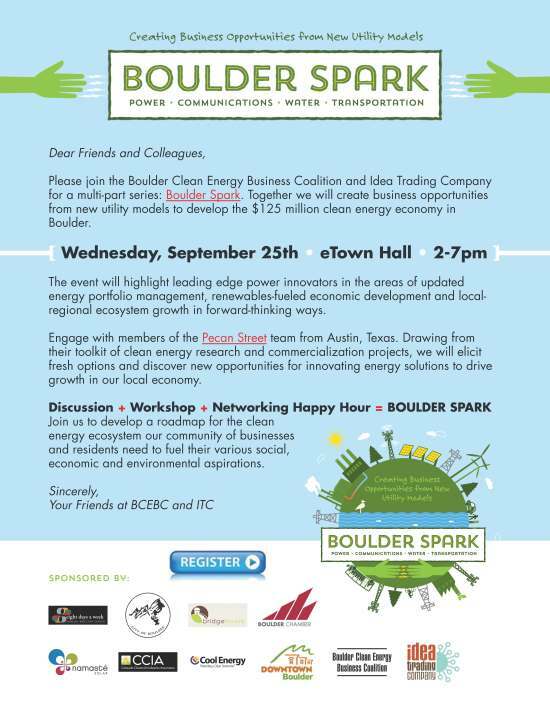 Please join the Boulder Clean Energy Business Coalition and Idea Trading Company for a multi-part series, Boulder Spark. Together we will create business opportunities from new utility models to develop the $125 million clean energy economy in Boulder. The event will highlight leading edge power innovators in the areas of updated energy portfolio management, renewables-fueled economic development and local-regional ecosystem growth in forward-thinking ways. Wednesday, September 25th at eTown Hall, 2-7 p.m. Engage with members of the Pecan Street team from Austin, Texas. Drawing from their toolkit of clean energy research and commercialization projects, we will elicit fresh options and discover new opportunities for innovating energy solutions to drive growth in our local economy.